One of the governorship aspirants in the Peoples Democratic Party in Osunstate Alhaji Fatai Akinbade has called on leaders and members of the party to embark on aggressive house -to-house awareness and campaign for the collection of the Permanent Voter Cards ahead of the September 22 election. 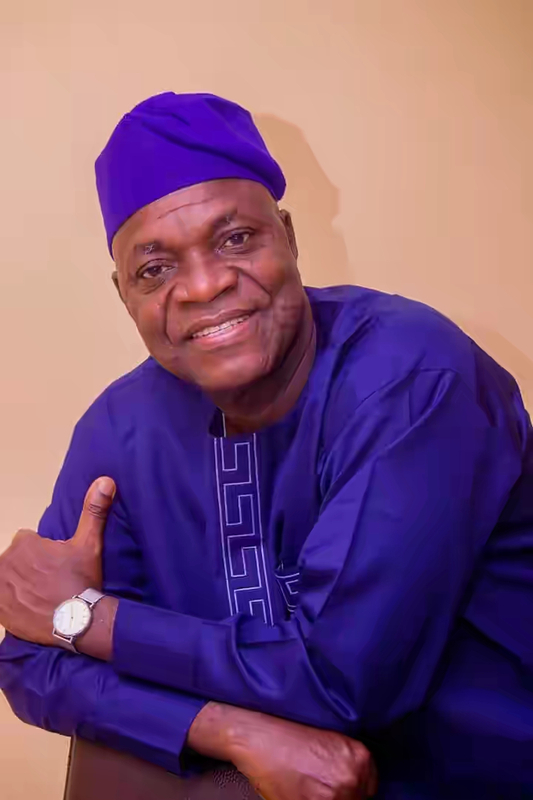 Akinbade made this known while delivering his speech at the Presentation of his Letter of Intent to Contest the 2018 Governorship Election, at the Party Secretariat, Biket Area, Osogbo on Tuesday. He argued that the people of the state were tired of the ruling All Progressive Congress saying they were ready to issue APC red card through their PVC. He urged members of the PDP in the state to unite and eschew bitterness adding that campaigns should be issue based in order to convince electorate of the party's readiness to unseat APC. The PDP chieftain said, "My mission here today as we are all aware, is to submit my Letter of Intent to contest the governorship election of the state in September, this year. This is line with the dictate of our great party, particularly at the state level, which to me, is a major step towards the actualization of my dream of ruling the state. "Osun is blessed, Osun State PDP is equally blessed. I say so because everybody within the party that has signified the intention of ruling the state is qualified. However, at the risk of sounding immodest, I think I stand a shoulder high and above other contenders. This I say without disrespecting my fellow contenders." Explaining why he declared intention to succeed Aregbesola and on his campaign slogan, "Fatai Lokan," he said, "Given my rich background in all spheres spanning over 20 years, there can be no better time than now, for me to be the next Governor of our dear state, after Ogbeni Rauf Aregbesola must have exited the state. "Firstly, as a Commissioner for Works in the state for four years (1994-1998), I provided the needed valve through the World Bank Assisted Road Projects during the military administration which laid firm foundation of the first class Inter-city and inter-state road networks the state enjoys till date. With due process, 16 of such roads were constructed. These include Awo-Ogbaagba-Iwo road, Osogbo-Ibokun-Oke Imesi-Ekiti road, Ada-Ibokun-Ilesa-Idominasi road, Ede-Ara-Ejigbo road, Apomu-Orile Owu-Araromi road, Ilesa-Ifewara road and the celebrated Osogbo West Bye-Pass dual carriage among others. "In addition, the Residential Quarters for Commissioners in the State at the GRA in Osogbo was my idea. This I achieved through prudence by converting the Consultants’ accommodation allowances into the construction of the Quarters that stand till date for the use of successive administration. Again, you all recall that as the PDP State Chairman, I, with the solid support of the people of the state, won all the 26 seats in the State House of Assembly, 9 Federal House of Representatives, the 3 Senatorial seats as well as the governorship seat in 2003. Equally, without any infraction or blemish, I, as the Secretary to the State Government for almost 8 years, successfully integrated and implemented all matters of state policies. This I did with high sense of commitment, comportment, candor, carriage and teamwork. "My life is an open secret to many. I am a qualified and successful Civil Engineer. As a former Commissioner for Works and one-time Secretary to the State Government (SSG), I understand very well, the workings of the government and the needs of civil servants in the state. As a former State Chairman of the party, I am familiar with the political terrain and how to better the lots of party members. Outside the government, precisely in my private concerns, I have been thriving. "My age and experience have placed me in a better stead above others, especially if the unfortunate manner the state is currently being administered by the APC is anything to go by. More than ever before, I am ready. I want to assure you that I have the means and wherewithal to prosecute the coming election with God’s help and the backing of some well-meaning individuals. To this effect, from my camp, the Soludero Movement, we shall soon begin to roll out some things that will astound our detractors. Just watch out. "Indeed, today is epochal given the fact that we are gradually inching towards our desired destination of taking over the reins of power in the state, from the current occupants at Abere Governor’s office. This even becomes more instructive if one considers the fact that we have, in the recent past, been faced with some challenges as a party. Thank God it's becoming a thing of the past. Speaking further, Akinbade said "Our people in this state have suffered enough hardship in different shapes and sizes in the hands of the Rauf Aregbesola administration. There is much hunger and anguish in the state. While Public Servants, Civil Servants, Teachers etc. have continued to receive half salaries and Pensioners living in penury and abject poverty, virtually all sectors of the state, have collapsed. "What is the implication of all these? Simply, an average common man on the street of Osun is looking up to our great party, the PDP, to come to his/her rescue. These expectations we must not bungle under whatever guise, otherwise generations to come will not forgive us. "To however save our people from these traumata, I want to sincerely and humbly charge our Executive, leaders, elders and stakeholders, to take up the gauntlet of ensuring the emergence of a credible candidate that will be acceptable to the larger populace through a credible and transparent process that will lessen friction within the party. Given the fact that our election is barely four months away, the time is short. "The fact that our people have been traumatized by the APC, does not mean we should take the party (APC) for granted. This is because as we all know, the party and its handlers, thrive in shenanigans. More importantly, we need a moral compass and rectitude in our efforts at unseating the APC at the forthcoming polls later this year. "While further appealing that we should avoid being presumptuous, our campaigns should be issues-based, the ones capable of lifting the spirit of our people currently at the lowest ebb. At the same time, we should eschew mudslinging, character assassinations and the likes. Let us sink our differences for us to achieve our desired objectives. In unity, we can move mountains and without it, we can do nothing. I want to appeal to all stakeholders not only to ensure the sorting out of grey areas, but to as well ensure that everybody is adequately carried along. "Lastly, I want to equally appeal to the party to embark on serious mobilization of members and people of the state on the importance of Permanent Voters’ Card (PVC). This is because while many youths who have attained the voting age of 18 years are yet to register, many who have registered, have refused to collect their PVCs lying fallow at various INEC posts across the state. In fact, as I speak, over four hundred thousand PVCs according to INEC are yet to be collected. This, to mean, calls for serious concern. The PVC is the red card our people can issue to the APC in the state. "Yes, let us embark on massive and aggressive house-to-house campaigns on PVCs’ drive. This is largely what we need to strengthen our voting resolve. In the same vein, I implore our people to always be law-abiding. We need not to encourage thuggery or violence related activities that can heighten tension. Without raising a finger, I believe we shall dislodge the APC because the resolve of the people can be stronger than an iron. "While I reiterate that Fatai Lokan (It is my turn), I thank everyone here present and pray that we shall reach our desired promised land," he added.